It is warm in Finland, some might even say too hot. Finnish people at least, although I am quite sure some of them are enjoying living at the sea side and being able to swim without freezing one or two toes off! When it’s a bit too warm I never know what to eat and I am certainly not in the mood of standing in the kitchen for hours while cooking. Perfect reason to leave the house and get some food elsewhere! 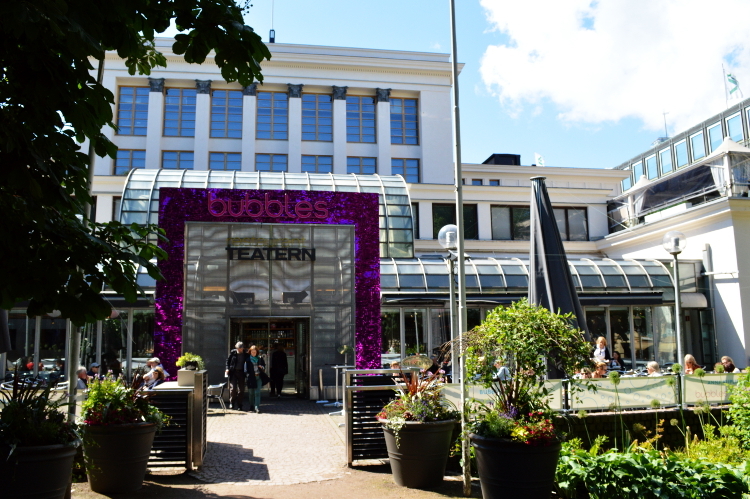 Teatteri is located in the building of the Swedish Theater at Esplanadi. During lunch time there is often a queue for their salads. That made me curious and I decided it would be time to try it out. 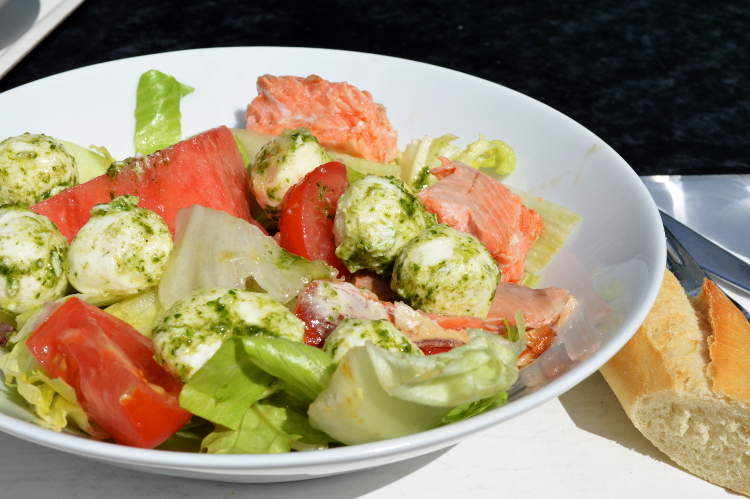 A big plate with lettuce, tomatoes and watermelon plus two toppings of your choice is 10€. They usually have lots of ingredients to choose from and also lots of vegetarian options. The price also Includes a piece of bread and a salad dressing. 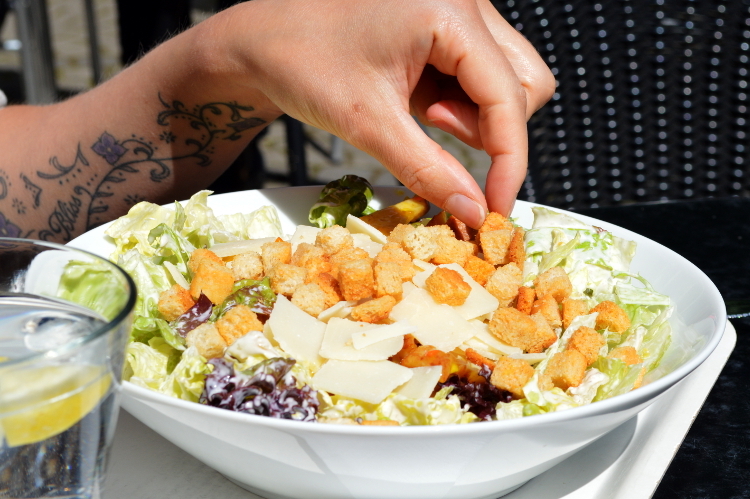 For a few cents more you can also get a Caesar salad with either chicken or shrimps. They have a big terrace if you want to enjoy the sun but also a lot of seats inside with comfy chairs and couches. Definitely worth trying and we will come back too! 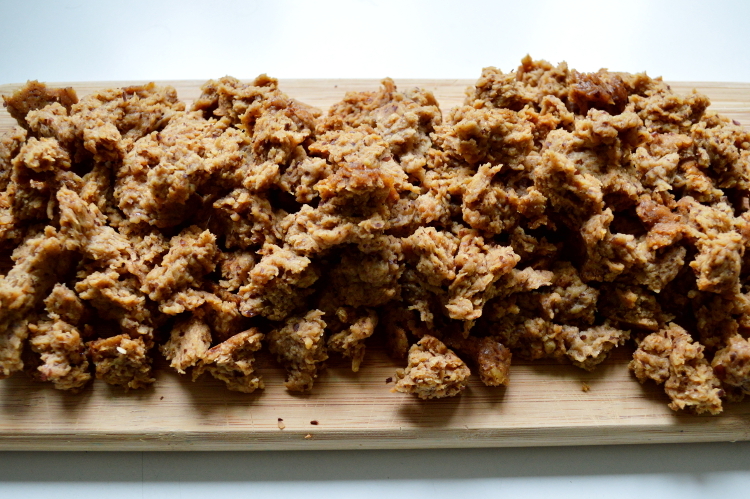 For a few years now I have experimenting with making seitan. I have to admit that before I met Tiia I didn’t even know what it was but I was intrigued right away. 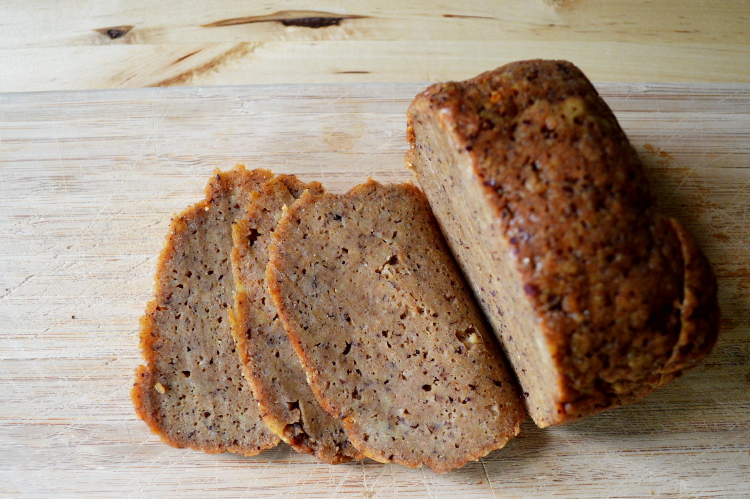 Seitan is made from wheat gluten and then steamed, cooked or baked. I always buy seitan flour online or at the supermarket. I have tried a few recipes but they were always a bit too bland or the amounts just weren’t working out perfectly. So here is what I have come up with over time. 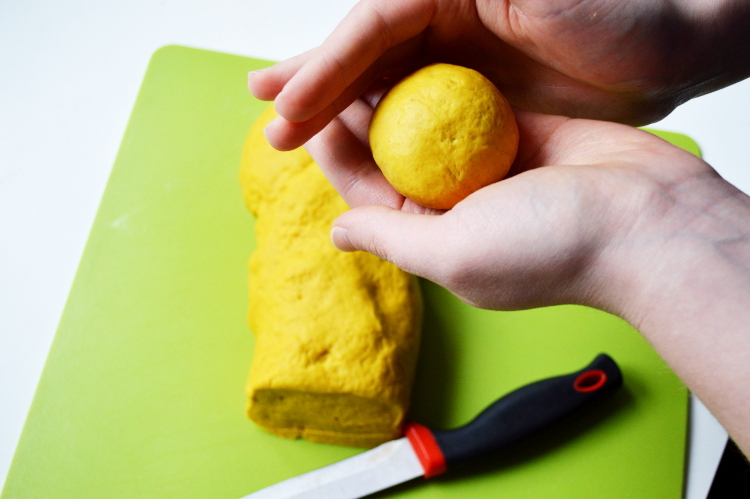 The first recipe is for a basic seitan loaf. That can be used to make the pulled seitan burger (scroll further down for the recipe) or, after baked, just be eaten by itself, on bread or as a steak. If you want to make the burger buns yourself you will find our recipe for those here. First heat up some water in a steam kettle. If you don’t have one you can just use a big pot and put a colander in it to steam the seitan. 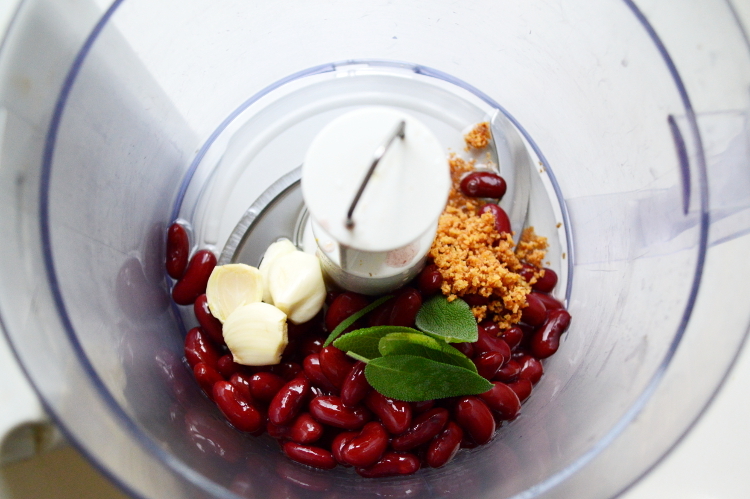 In a food processor blend together the beans, sage, garlic, onion and olive oil until everything is really smooth. 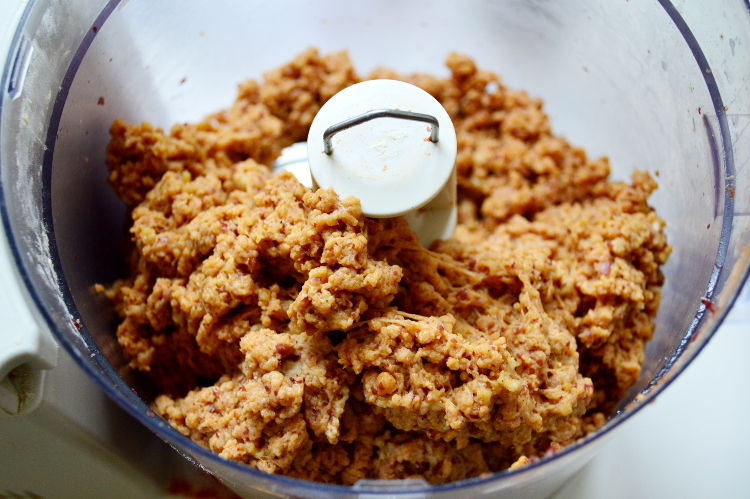 Add the rest of the spices, mix well and add the water and seitan flour. Depending on the type of gluten you’re using you might have to add more water. 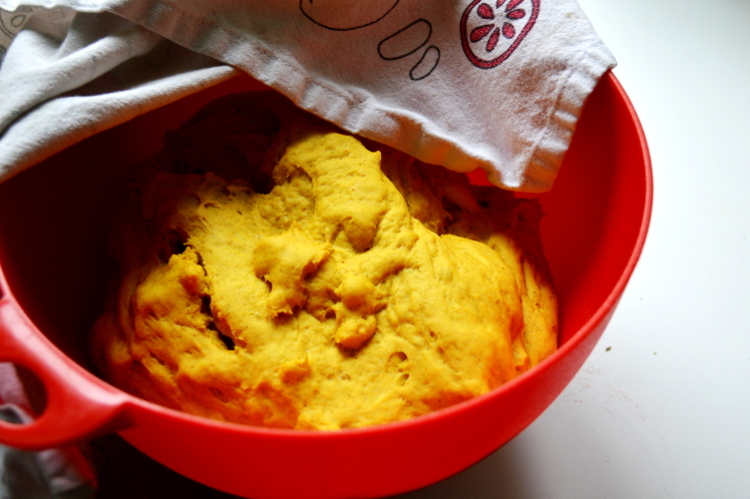 The dough is right when everything sticks together nicely. 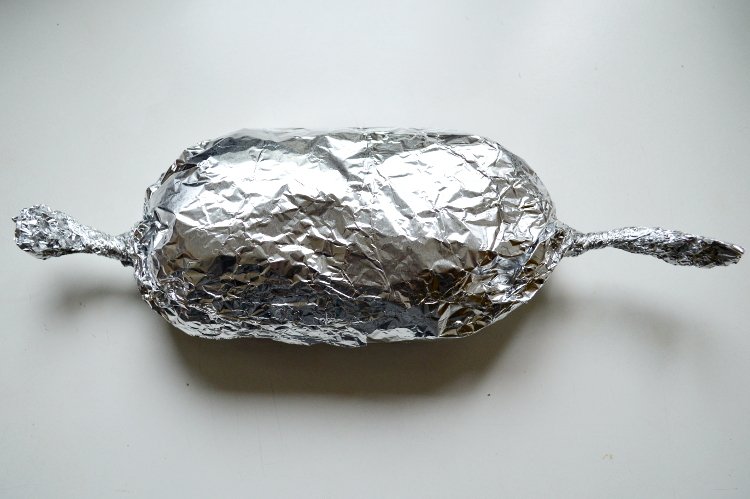 Form a loaf and wrap it in aluminium foil. Make sure it’s packed tightly and nothing can come out of the sides. When the water is ready, steam the seitan for 60 minutes. Turn it around once after 30 minutes. 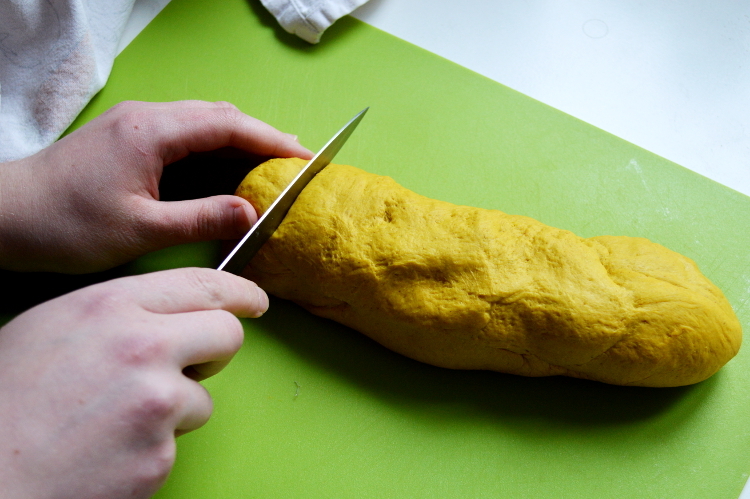 Now it depends on what you want to do with your seitan. If you want to use it as pulled seitan for burgers or sandwiches, steaming it should be enough since it will get fried later. If you want to eat your seitan thinly sliced on bread or as a steak for lunch it should go into the oven after it has steamed for an hour. 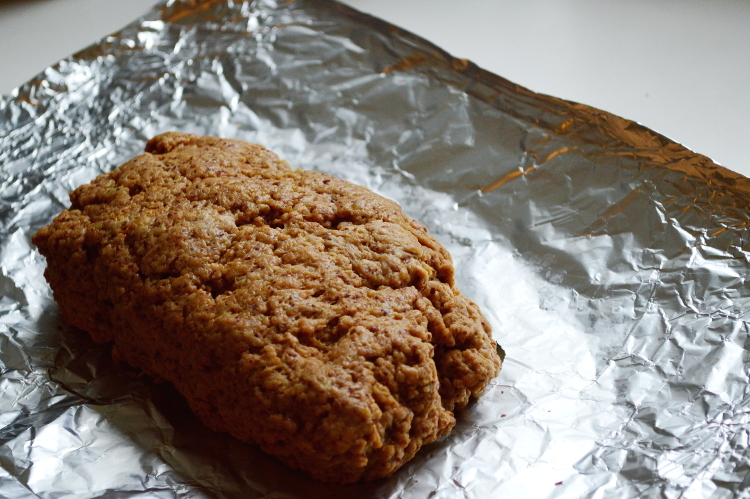 In this case heat up the oven to 175°C and let the seitan bake in the aluminium foil for another 60 minutes. I also like to use this recipe for other occasions like Christmas and fill the seitan with pesto and crushed nuts! 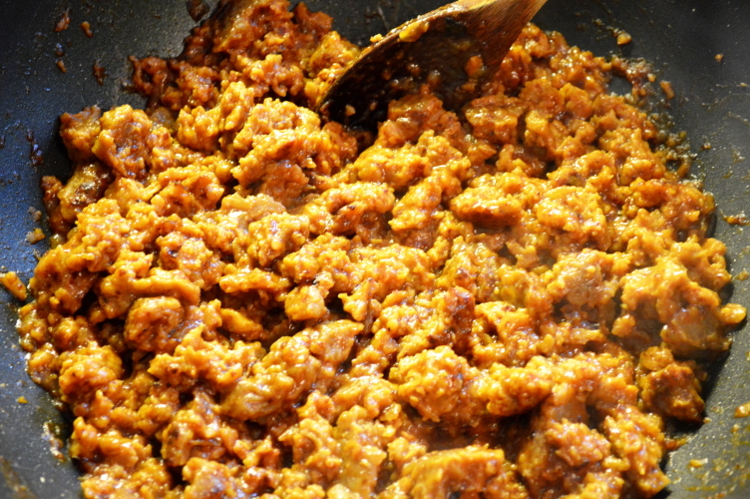 If you now want to make pulled seitan continue with the following recipe. 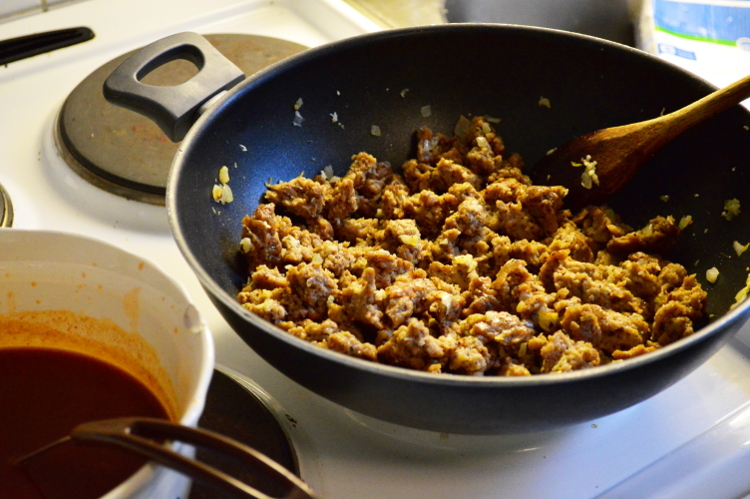 In a bowl mix together all the ingredients for the sauce and set aside. Pull the seitan apart with a fork and fry it in a pan with the oil until it gets a crust. Add the onions and the garlic only after 8 minutes or so since the seitan will take a while to fry and you don’t want to burn them. When the seitan looks done and the onion is glossy turn the stove to medium-low heat and add the bbq sauce. Let it simmer for a while until most of the liquid is gone. The bbq seitan will be soft and moist. If you like it to be a bit more firm you can also just bake the loaf in the oven after steaming, like written above in the basic recipe. Afterwards you can cut the loaf into desired pieces for the burgers and start the bbq recipe with frying the onion and garlic instead of the seitan. Add the seitan together with the bbq sauce since it doesn’t need to be fried anymore. 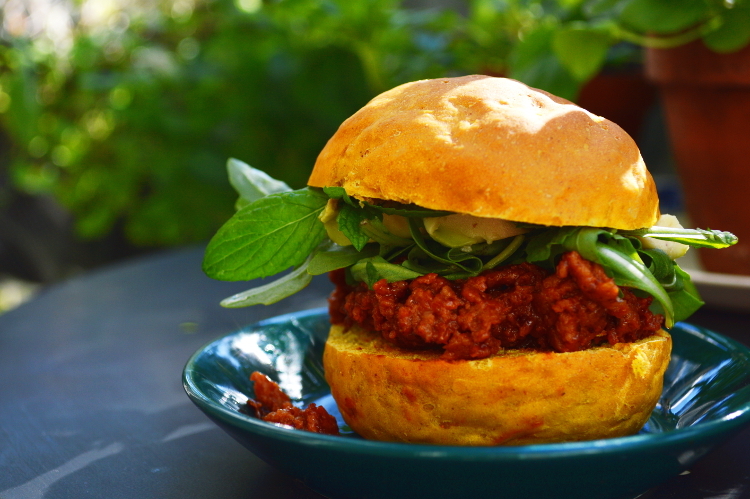 Serve with freshly made burger buns (recipe here) or on sandwiches. 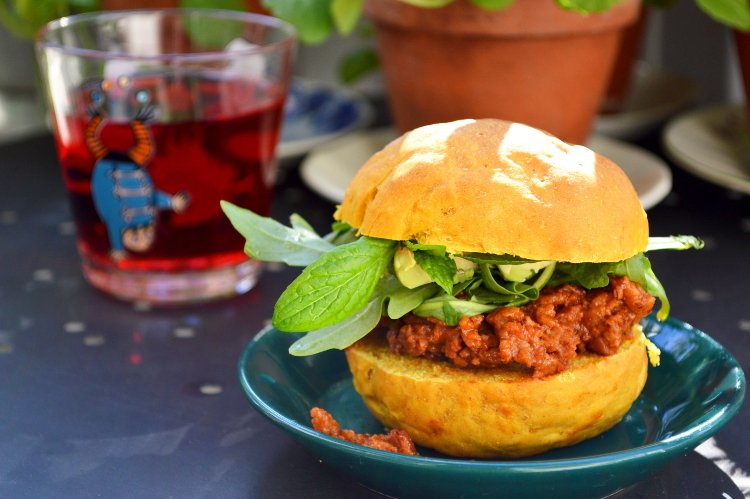 We ate our burgers with fresh rucola, avocado and mint. It made a great combination!